Other Information Prices are subject to change. 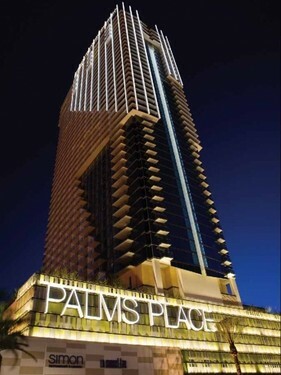 Introducing the hippest condo hotel in all of Las Vegas…..Palms Place! Attached to the world famous Palms Hotel and Casino, Palms Place is the Vegas hot spot. Offering studio suites with 600 square feet of luxury living space, including marble and hardwood floors, two plasma TV's, a king size bed and queen sleeper sofa, and a modernistic kitchenette. In addition, many suites offer breathtaking views of the Las Vegas Strip or the surrounding Spring Mountains. While being pampered as a guest of Palms Place, you can enjoy a full line of amenities and conveniences, including: the Drift Spa and Hammam, the full service Primp Salon, a contemporary pool with a full service bar and cabana rentals, nightlife entertainment at Rojo Lounge, and access to everything the Palms Hotel and Casino has to offer. Call our Toll Free Number (866) 469-6060 for rates and availability or visit us at www.CondoHotelMarketplace.com.